Are you steady on your feet or does your balance need some improvement? Would you like to add an extra element to your workout to increase your core strength without purchasing a large piece of exercise equipment? The Pono Ola Balance Board might be what you need. Let’s take a look. The Pono Ola is a balance board designed for exercise and as an accessory for standing desks. 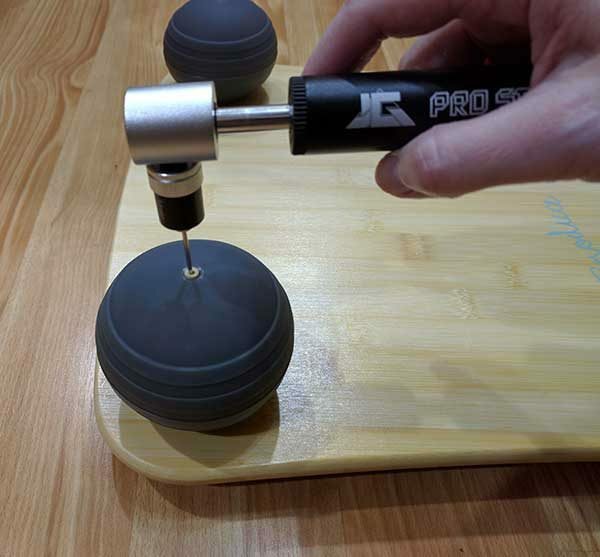 The Pono Ola is a 14.5 x 29.5 x 3.5 inch, 6 pound balance board that is made of .5 inch thick bamboo with four miniature yoga-style balls as feet. It’s attractive and well made. I didn’t find any rough edges or splinters. The board is smooth and well finished. The board comes fully assembled and ready to use. If the feet/balls need to be reinflated, you can do this with the included hand pump and 2 inflating needles. The pump does not have a gauge on it, and the instructions say to keep the pressure between 5 – 15 lbs. Note that the maximum weight that the Pono Ola is rated for is 250 pounds. This board can help improve your balance and stability during certain exercises (squats, push-ups, etc) and can also be used to help alleviate the monotony of standing at a standing desk. 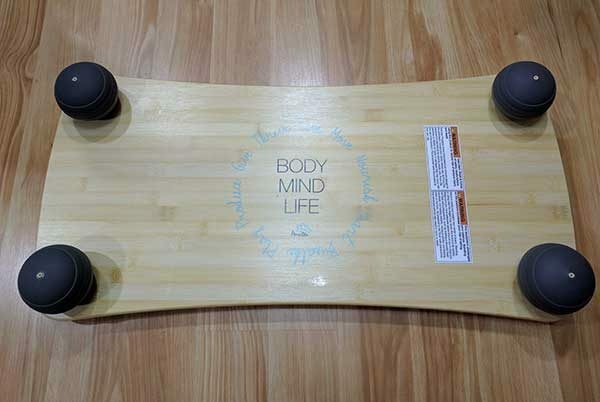 Just looking at it, you wouldn’t really think this board with the four mini yoga ball feet would really do very much in the way of improving balance, but I was surprised when I started using it. It really does help you engage your core even when doing easy exercises like the squats that I did in the quick video shown above. 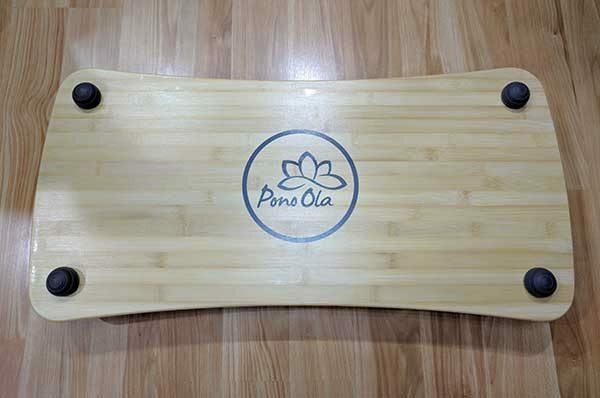 The top surface of the Pono Ola balance board is about 3.5 inches above the floor. I tested it on a hard floor and on medium pile carpeted floor. 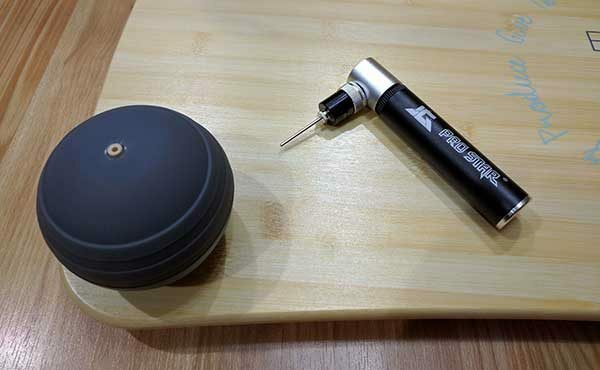 It worked well on both surfaces. I think the Pono Ola balance board is a well made easy to use balance board that would be a useful addition to core strength exercise routines and as a platform to stand on when working at a standing desk. My only criticism is the price. I feel that $140 is overpriced for what it is and I would be more enthusiastic about it if it were priced closer to $100. That said, it is well made and should last for a long time as long as the feet/balls don’t spring a leak. Source: The sample for this review was provided by Pono Ola. Please visit their site for more info and Amazon to order. Pono Ola Balance Board review originally appeared on The Gadgeteer on January 31, 2017 at 4:29 pm. Caroline Biggs is one of six people tracking their resolutions with Apartment Therapy in real time. You can read her earlier installments here and here. According to a recent study, there are a whopping 2.3 billion active social media users worldwide. That's nearly one-third of the entire human population that, per another staggering study, spends around an hour of every day on Facebook alone. This means the average social media user spends more time on Facebook every day than they do practicing any other leisurely activity, like reading, exercising, or socializing with friends. Social media seems to be our universal pastime. For those of us who hate being bound to a desktop, we tend to bring our laptops with us wherever we go—from home, to the coffee shop, to the office, to our trip to Tibet (new year's resolutions?). That's a lot of opportunities for damage—not to mention, compliments. The safe and stylish cases that made our list manage to check both boxes, promising to keep our tech pretty and protected whether we're sitting on our couches or couch-surfing around the world. Your phone can do it all these days, thanks to a never-ending supply of apps. In fact, your phone can help you find your dream home in just a few taps and swipes, if you want it to. Real estate apps are a great way for aspiring buyers or just real-estate hobbyists to take a home search on the go—think looking through dream apartment listings while you're waiting in line, scoping out a hot property on your lunch break or even checking out a beach house from the doctor's office waiting room. The plights of the winter warrior are plenty, but one in particular is figuring out how to keep your hands from turning blue and numb in freezing temps while still staying connected. These 11 touchscreen-compatible gloves are here to solve that problem for you. Two TVs. Their boxes are full of confusing terms and complicated jargon. And their prices are night and day. How do you know if the pricey TV is worth the money? What are you really getting for the upgrade? It's hard to know for certain while you're standing in the store, and online reviews just make things even more byzantine. At the end of the day, it can be tough to know what you're paying for when you're buying a TV. So we're putting two sets head to head—one under $500 and one over $2,000—to look at their differences and similarities for the money. Caroline Biggs is one of six people tracking their resolutions with Apartment Therapy in real time. You can read her first installment here. You'd be surprised to discover how often you check Instagram. True you might only spend a few minutes total scrolling through it every day, but if you're anything like me—i.e. committed to staying off social media for a month—you'll come to find you check your apps almost compulsively, at all hours of the day. So you're shopping for a new television. You enter a big box store and find yourself standing in front of a synchronized wall of flashing monitors, a dizzying world of sensory overload that gives you everything except answers to your questions such as: Will this picture look as good in my home as it does here? What features will I really use? Why is it so hot in here, and why don't these stores serve cocktails? !